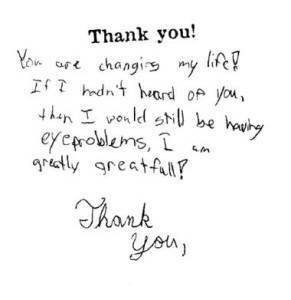 We are proud of the results kids get from our vision therapy program. Here are some of the kids stories and what some children have experienced after vision therapy. DS was a 9 years old girl who was experiencing significant difficulty with reading. She was diagnosed with eye coordination problems of Exophoria, Accommodative Insufficiency, and Oculomotor Dysfunction of Pursuits. HF was an 8 year old girl who had difficulty maintaining clear vision and distinguishing letters appropriately. She was diagnosed with amblyopia, so even with the glasses, she did not see well. HS was an 8 year old girl who had difficulty viewing close work such as reading and writing, because it is was more difficult for her eyes to move and focus than would be expected at her age. She was diagnosed with the visual focusing problems of Accommodative Insufficiency and eye movement problems of Oculomotor Dysfunction of Pursuits and Saccades. Does your child struggle with school work? Do they have poor attention or difficulty with reading comprehension? Call us at 813-792-0637 to find out if they have a hidden visual problem.